MYSTERY SOLVED: Readers of this newsletter may remember that we have written several times over the years about the fate of the “Levy Lions,” the four statues that Jefferson Levy had arrayed at Monticello. The lions—which were pictured oin the engraving of Monticello that was on the back of the $2 bill from 1929-1976—were sold after the Thomas Jefferson Foundation bought Monticello from Levy in 1923 and disposed of all of its non-Jefferson contents. 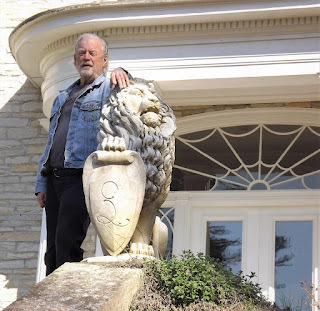 Decades later, we learned that two of the lions made their way to Cheekwood Gardens in Nashville. But the fate of the other two remained unknown. Until now. Rebecca English, who lives near Charlottesville, started a quest to find the two missing Levy Lions after she thought she spotted one outside a house not far from Monticello nearly five years ago. She first wrote about that on her excellent Forsythia Hill blog in December of 2013. In that and subsequent posts Rebecca reported on her progress (or lack thereof) trying to track down the missing lions. Then early this year she hit pay dirt. 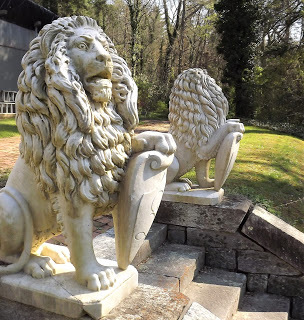 She discovered the lions at a historic home listed for sale in Hendersonville, North Carolina, near Asheville. 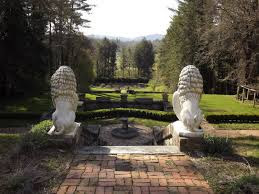 The Levy Lions sit regally on the rear terrace (see photo above) of a historic house called Chanteloup, which was built in 1840 for a French count and countess on 28 acres of land and sometimes is known as “Little Biltmore.” In 1900 new owners brought in the pioneering landscape architect Frederick Law Olmsted to design the terraced gardens. Below are photos Rebecca took and kindly gave us permission to use of the lions at Chanteloup. 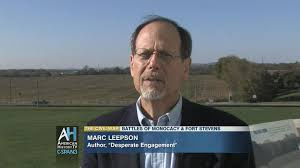 · Tuesday, May 1– Talk on Ballad of the Green Beret and book signing for the Veterans Military History Group at the Silver Spring (Maryland) Senior Center. · Monday, May 14 – Talk on What So Proudly We Hailed: Francis Scott Key, A Life for the Chasseur Chapter of the United Daughters of 1812, Sandy Spring, Maryland. Thanks so much Marc for sharing my finding. It was a memorable day!